In the conclusion of our 3-part water potential series (see part 1), we discuss how to measure water potential—different methods, their strengths, and their limitations. 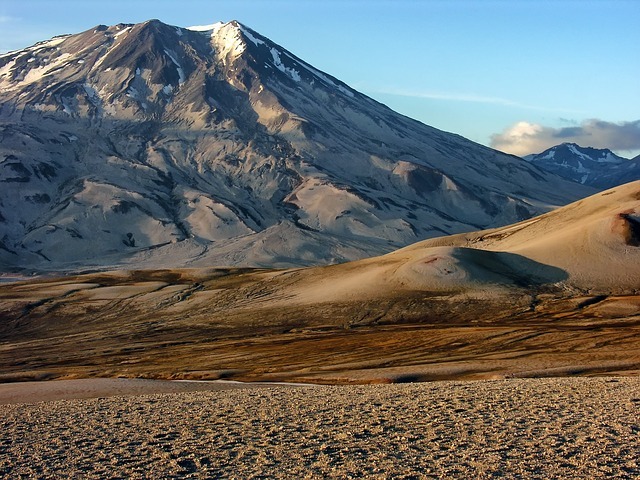 Vapor pressure methods work in the dry range. Essentially, there are only two primary measurement methods for water potential—tensiometers and vapor pressure methods. Tensiometers work in the wet range—special tensiometers that retard the boiling point of water (UMS) have a range from 0 to about -0.2 MPa. Vapor pressure methods work in the dry range—from about -0.1 MPa to -300 MPa (0.1 MPa is 99.93% RH; -300 MPa is 11%). Historically, these ranges did not overlap, but recent advances in tensiometer and temperature sensing technology have changed that. Now, a skilled user with excellent methods and the best equipment can measure the full water potential range in the lab. There are reasons to look at secondary measurement methods, though. Vapor pressure methods are not useful in situ, and the accuracy of the tensiometer must be paid for with constant, careful maintenance (although a self-filling version of the tensiometer is available). Here, we briefly cover the strengths and limitations of each method. The WP4C Dew Point Hygrometer is one of the few commercially available instruments that currently uses this technique. Like traditional thermocouple psychrometers, the dew point hygrometer equilibrates a sample in a sealed chamber. A small mirror in the chamber is chilled until dew just starts to form on it. At the dew point, the WP4C measures both mirror and sample temperatures with 0.001◦C accuracy to determine the relative humidity of the vapor above the sample. The most current version of this dew point hygrometer has an accuracy of ±1% from -5 to -300 MPa and is also relatively easy to use. 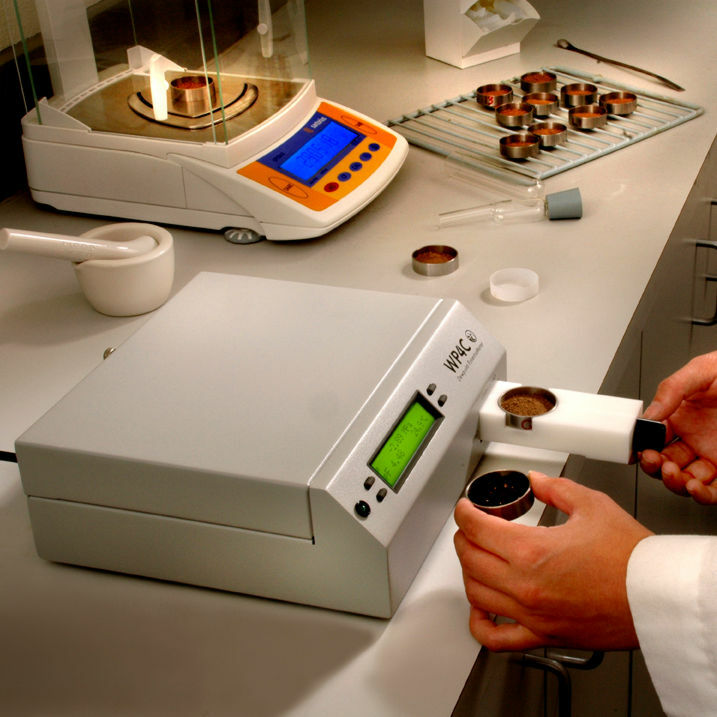 Many sample types can be analyzed in five to ten minutes, although wet samples take longer. At high water potentials, the temperature differences between saturated vapor pressure and the vapor pressure inside the sample chamber become vanishingly small. Limitations to the resolution of the temperature measurement mean that vapor pressure methods will probably never supplant tensiometers. The dew point hygrometer has a range of -0.1 to -300 MPa, though readings can be made beyond -0.1 MPa using special techniques. Tensiometers remain the best option for readings in the 0 to-0.1 MPa range. Water content tends to be easier to measure than water potential, and since the two values are related, it’s possible to use a water content measurement to find water potential. 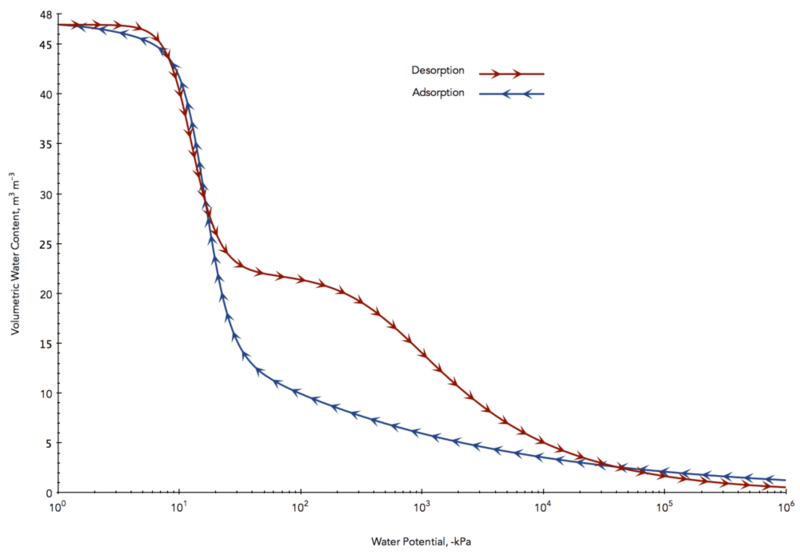 A graph showing how water potential changes as water is adsorbed into and desorbed from a specific soil matrix is called a moisture characteristic or a moisture release curve. Example of a moisture release curve. Every matrix that can hold water has a unique moisture characteristic, as unique and distinctive as a fingerprint. In soils, even small differences in composition and texture have a significant effect on the moisture characteristic. Some researchers develop a moisture characteristic for a specific soil type and use that characteristic to determine water potential from water content readings. Matric potential sensors take a simpler approach by taking advantage of the second law of thermodynamics. 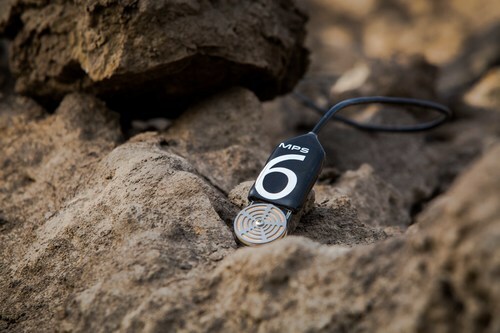 Matric potential sensors use a porous material with known moisture characteristic. Because all energy systems tend toward equilibrium, the porous material will come to water potential equilibrium with the soil around it. 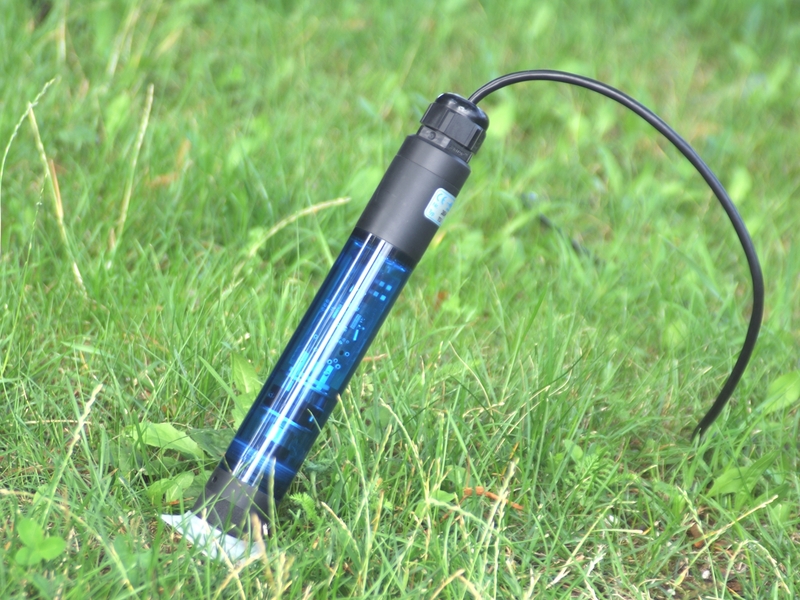 Using the moisture characteristic for the porous material, you can then measure the water content of the porous material and determine the water potential of both the porous material and the surrounding soil. Matric potential sensors use a variety of porous materials and several different methods for determining water content. At its best, matric potential sensors have good but not excellent accuracy. At its worst, the method can only tell you whether the soil is getting wetter or drier. A sensor’s accuracy depends on the quality of the moisture characteristic developed for the porous material and the uniformity of the material used. For good accuracy, the specific material used should be calibrated using a primary measurement method. The sensitivity of this method depends on how fast water content changes as water potential changes. Precision is determined by the quality of the moisture content measurement. Accuracy can also be affected by temperature sensitivity. This method relies on isothermal conditions, which can be difficult to achieve. Differences in temperature between the sensor and the soil can cause significant errors. All matric potential sensors are limited by hydraulic conductivity: as the soil gets drier, the porous material takes longer to equilibrate. The change in water content also becomes small and difficult to measure. On the wet end, the sensor’s range is limited by the air entry potential of the porous material being used. Read about the strengths and limitations of tensiometers and other traditional methods such as gypsum blocks, pressure plates, and filter paper here.